22 hilarious mini-games as you attempt to collect all the charmingly dumb characters for your train station, achieve high scores and unlock the famous music video that started it all. 22 hilarious mini-games as you attempt to collect all the charmingly dumb characters for your train station, achieve high scores and unlock the famous music video that started it all. DO OR DRY – Slow-witted Bungle is hiding in a clothes dryer but someone’s started the machine! Stop the machine before it’s too late! BAT ATTACK – Help Doomed avoid the drug dealer’s wrath after scratching his brand new car. KILL PILL – Make sure Pillock picks the right bottle of medicine or suffer the consequences. KIDNEY BEAN – Dunce sold his kidneys on the internet for extra cash. Stitch him up before he bleeds to death! 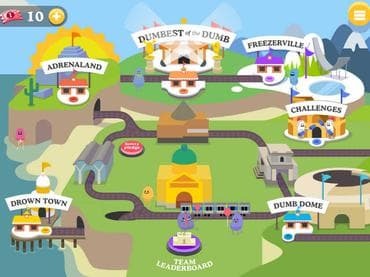 Если у Вас есть вопросы, связанные с игрой Dumb Ways to Die пожалуйста используйте эту форму для связи с нами.